Mehrunes Dagon is the daedric prince of destruction, revolution and ambition. He is the progenitor of Dremora and rules over the Oblivion realm of the Deadlands. High Kinlady Estre is a vassal of his, and offers up her soul to him following the Veiled Heritance's repeated defeats, in exchange for Daedric reinforcements. Under his command, she has desecrated Torinaan, pillaged Dawnbreak, and led an invasion of Firsthold, where she is defeated in The Refuge of Dread of the Deadlands. A cult of his worshipers led by Razor Master Erthas led an attack on the settlement of Whisper Grove, where it has now become the City of Ash. 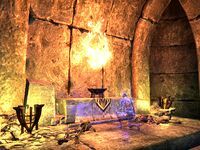 Following Erthras' death, he puts an end to the invasion in exchange for Gilraen, who becomes the holder of the Mehrunes Razor. Her husband Fingaenion later hires the Undaunted to travel into the Knives of Discord region of the Deadlands in City of Ash II. Gilraen: Are you... Mehrunes Dagon?" Mehrunes Dagon: "It was you who rallied this peasant village to contend with me. Fascinating that a mortal could be so troublesome. Mehrunes Dagon: I need a replacement for your Erthas. Come. Meet with me, and I will close this Oblivion gate, spare your people." She runs into the gate, and it closes behind her. Mehrunes Dagon has no statue present in the game. This page was last modified on 25 December 2018, at 00:31.